Lori and I got invited to join other Roadfood friends in a weekend gathering in and around Raleigh, North Carolina. The folks gathering are among the most passionate of Roadfooders, and I expected that this might be the sort of debauch that gets exaggerated into weekend-in-Vegas movies - although instead of hangovers and inexplainable hickeys, the aftereffects of our bacchanal would be gravy stains and crumbs. Our first stop upon landing in Raleigh was Bavarian Brathaus of Cary, selected by Poverty Pete because it served pork knuckle (schweinshaxen), which is common in Germany but rare in the US. 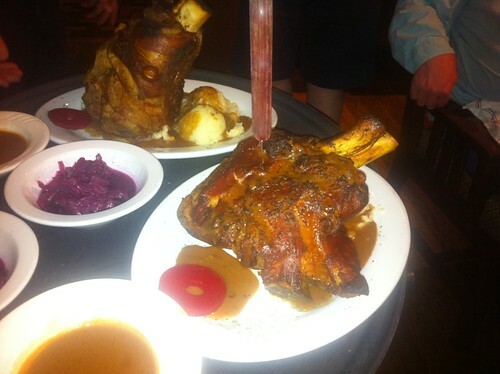 The pork knuckle required a one-day advance notice, which we declined because we thought that the dinner would be before we landed. But the dinner got rescheduled for later, and we came along. 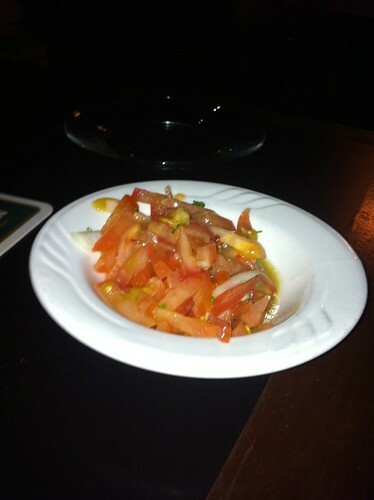 The first course was a tomato salad. This was very tasty, and the tomatoes were pretty good - I liked this a lot. 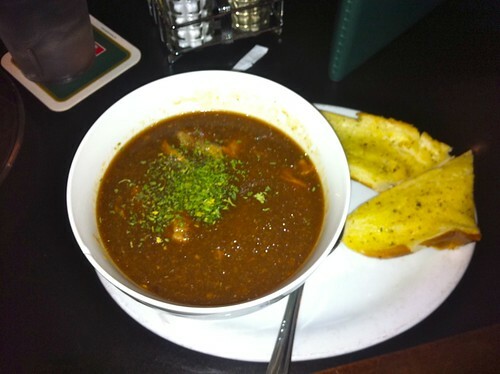 Through a miscommunication with the waitress, I ended up with ChiTownDiner's Braumeister Gulasch appetizer, when I had intended to order the gulasch dinner. The gulasch was not what I expected from goulash; it was just broth and beef, without any vegetables. But it was delicious; the broth was very savory and rich, with a touch of paprika. I finally got some of the sides that came with the gulasch dinner: a pair of Semmelknödel. The menu called these bread dumplings, but they didn't have the wet texture I expect from dumplings; they were hemispheres of dense stuffing-like bread, with a crust that made me wonder if they had been deep-fried. Poverty Pete had ordered a pork knuckle for himself and one for the table, and pork knuckle was by far the most dramatic meal of the table, mostly because it was so large. I sampled a bit of it, and it just tasted like roast pork to me, though it was tender and juicy. 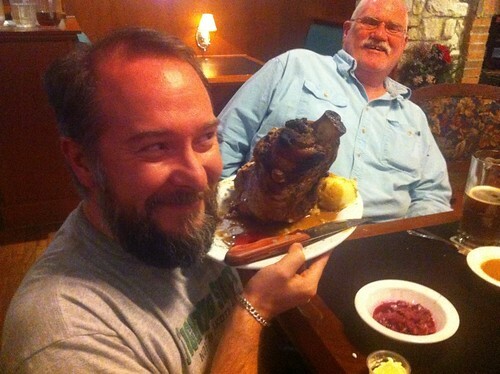 Even after four people had helped themselves to the pork knuckle, the leftovers were still half the size of Chris Ayers' head. We made lots of jokes about the pork knuckle, such as suggesting that it would need a helmet when Poverty Pete took it home. Many of the other dishes didn't impress me that much; Gregg's sauerbraten seemed a bit below par to me, as did Lori's bratwurst. I also wasn't wild about the apple strudel for dessert; part of that is that a crust that is not extraordinarily tender will squoosh out the filling under the pressure of a fork, but I also felt that a strudel should have smaller, more tender apple chunks than this contained. Even so, we were off to a good start. And as an extra bonus, we got to hear the oompah band playing "Puttin' on the Ritz".